"Five friends go for a break at a remote cabin in the woods, where they get more than they bargained for. Together, they must discover the truth behind the cabin in the woods." As much as I really want to give you my review of "The Cabin in the Woods", with so many other horror bloggers all falling over themselves to write about the same clever yet unscary movie, I thought I'd give everyone else a chance at some page hits. Much as I did last year with "Scream 4" (ironically another "meta-horror"), I'm simply going to list all the reviews from my blogroll as and when they happen. 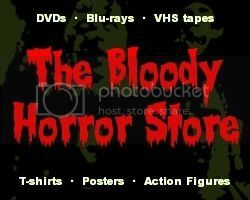 You can call it a "shoutout" if you like as I'm sure there are quite a few horror blogs here which you've never heard of and would be wise to follow. Dinner With Max Jenke - The Horror Film To End All Horror Films? Also, just like before, I'm going to wait until the DVD comes out and not get caught up in this zero-day maelstrom of spoilers (although I think you can probably tell what I thought of "The Cabin in the Woods" anyway). If you follow me on Twitter then you already know. Anyway, if you have yet another review of "The Cabin in the Woods" which I haven't mentioned, just leave it as a comment below and I'll edit it into this post accordingly.